The Social Addon for Envira Gallery will allow you to easily share your gallery and lightbox images to some of the most popular social networks. 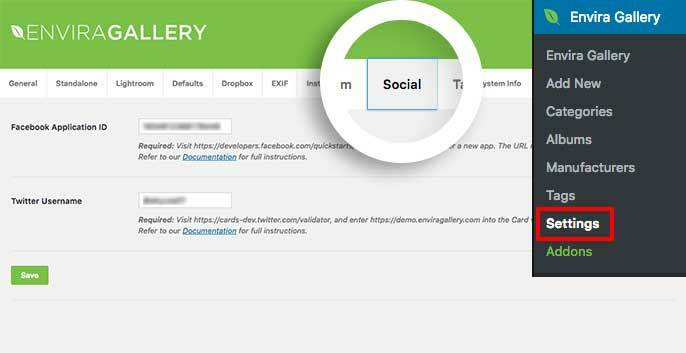 We’ll walk you through how to set up the Social Addon for your Envira galleries. Can I enable an Instagram share button with the Social Addon? Why aren’t my Summary Cards loading in the Tweet when I try to share on Twitter? Why are my images not showing in the share window when I’m sharing on Google+? Some of the options aren’t showing on the Lightbox tab? I’m not seeing the Advanced Settings? The Pin All isn’t working? Why is Facebook is sharing the wrong image? Would I be able to use more than one tag when using Envira Tags? Can I use the Social Addon with albums? What is this message about Google + all about? Why is WhatsApp not showing on the Social Tab? In this instance, you’ll be activating the Envira Social Addon. Before we begin, there are a few things that need to be set up for Twitter and Facebook first. To set up Facebook sharing you’ll need to complete our guide to to create and add your Facebook Application ID to the Social Settings tab. To set up Twitter sharing, just add your Twitter username to the Twitter Username field using the @ symbol and click Save. Once the Facebook Application ID and the Twitter Username have been added, it’s time to enable the social sharing on our gallery. Next, navigate to the Social tab and click the box to Display Social Sharing Buttons? then select the rest of your options for the gallery. 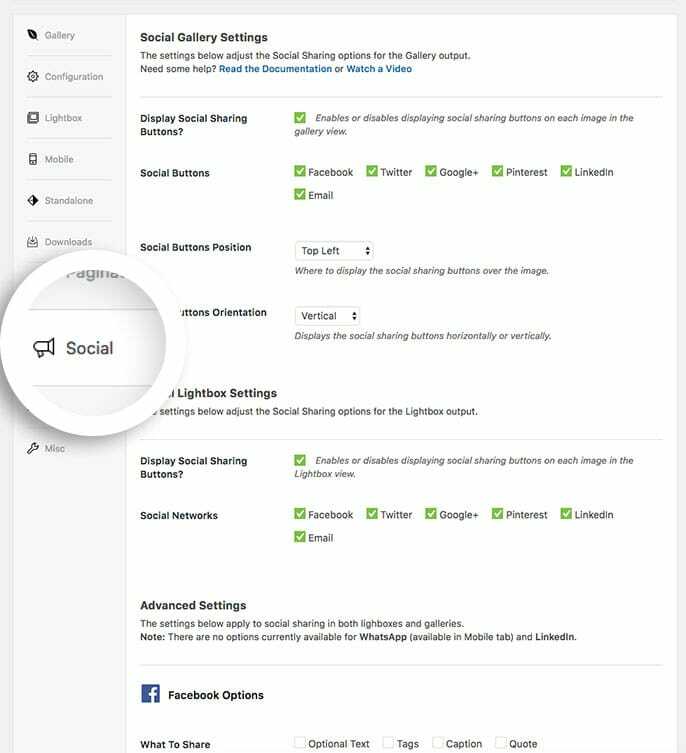 You’ll also notice you have options specific to your Social Lightbox Settings as well as Advanced Settings on this tab. 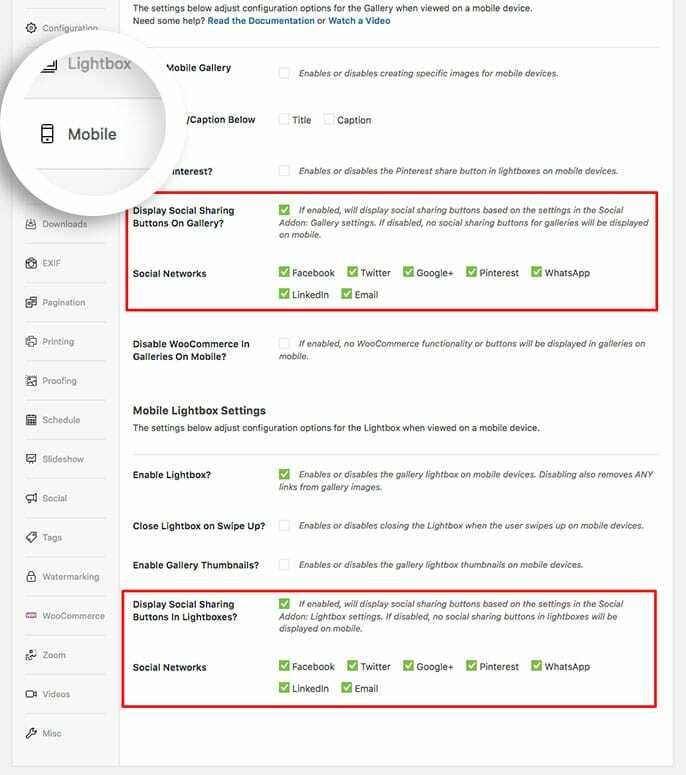 In your next step, navigate to the Mobile tab, here you can also choose to turn on or off certain social networks (or all) for your mobile viewers on the gallery and lightbox view. And that’s it, you can now share your gallery and album images to the social networks you’ve selected above using Envira’s Social Addon. Q: Can I enable an Instagram share button with the Social Addon? A: At this time, Envira doesn’t have the permissions from Instagram for this type of sharing. Q: Why aren’t my Summary Cards loading in the Tweet when I try to share on Twitter? A: Check that your site’s robots.txt file isn’t blocking Twitterbot from crawling any directories that contain Envira galleries and ablums. If you haven’t done any custom edits to the robots.txt file be sure that the Search Engine Visibility setting in your WordPress installation is disabled in the WordPress Admin » Settings » Reading page. For more information see Twitter’s documentation on crawling. 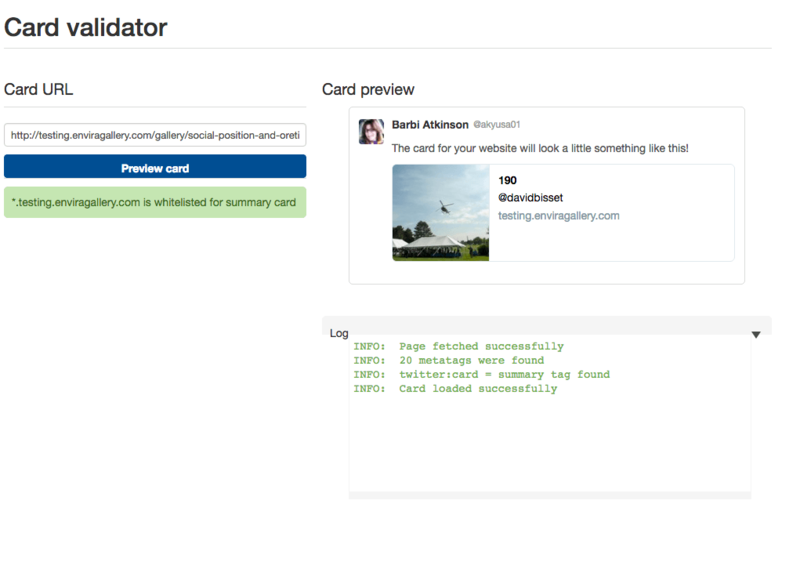 Once you’ve copied the share URL, go to https://cards-dev.twitter.com/validator and paste it into the Card URL field. Select the Preview Card button to validate the URL and check for any errors. Even if you are not planning on using Twitter, this tool is a good tool to use for all testing. If your site times out in this test for any reason, this can affect the other social network sharing and this tool will help you find the timeout error more quickly than Facebook debugging can. Q: Why are my images not showing in the share window when I’m sharing on Google+? An image meeting the above requirements is always rendered with a width of 506, 426, or 346 pixels, depending on the width of the user’s viewport. depending on the user’s browser viewport width, images may finally be scaled to 426px or 346px wide, maintaining the aspect ratio post-crop. Be sure the images in your gallery meet Google’s image requirements for sharing. Q: Some of the options aren’t showing on the Lightbox tab? A: Some options like choosing to display the social icons outside of the lightbox, or to choose the orientation of icons, are available only with specific lightbox themes. If you’re using either the Base Dark or Base Light lightbox themes neither of these options are available to be configured. Q: I’m not seeing the Advanced Settings? A: Be sure you have the latest version of the Social Addon installed on your site. Earlier versions of the addon did not contain the Advanced Settings. Q: The Pin All isn’t working? A: When using Pin All and sharing images from the lightbox view, only the current image will be shared. The Pin All functions only when sharing outside of lightbox view. Q: Why is Facebook is sharing the wrong image? A: Please check with your hosting company that they are not blocking any meta tags in your sites header.php. If Facebook can’t find the correct tags for the image to share it will share the first image it comes to on the page after it loads. Q: Would I be able to use more than one tag when using Envira Tags? A: Facebook’s API has placed this limitation on the amount of tags for Facebook sharing and will only accept one tag to be shared. When setting the Facebook Tag to Envira Tags using the Tags Addon, the first tag set in the Tags tab will be used. Q: Can I use the Social Addon with albums? A: Absolutely! The Social tab is also available when creating or editing an Envira Album. A: The message you see there is giving you a head’s up that Google + is retiring the social network. Please read their article for further explanation. A: The WhatsApp social sharing is only available on Mobile devices so the option to use this network will only show on the Mobile tab of the gallery. Added: Depreciate notice for Google+. Fix: Duplication of social icons in legacy lightbox in certain setups. Fix: Resolved minor issues with Pinterest, Facebook and email sharing. Fix: Resolved issue when social icons were not showing on album Lightboxes in some cases. Fix: Social icons not appearing in video lightboxes. Fix: Sharing in Google+ not sharing description. Fix: Sharing in Google+ showing improper HTML. Fix: Minor bugs with Facebook sharing. Fix: Facebook Lightbox sharing hashtag. Fix: Google+ Descriptions on lightbox sharing. Fix: Issue with sharing and permalink settings. Update: Total rewrite from top to bottom. Added new general settings for Facebook, Twitter, Google+, and Pinterest sharing. Added: Ability to control social icons for mobile for both galleries and lightboxes. Added: Email sharing now includes link to page when possible. Added: Rich Links for Pinterest added (requires Pinterest to approve site). Added: Added social buttons for gallery view for albums. Added: Support for deep linking when sharing. Fix: Facebook text from being ignored. Update: Ability to determine which Facebook page to share on. Fix: Icons appearance in lightbox improved. Fix: Hover stat changed so icons will not disappear in certain instances. 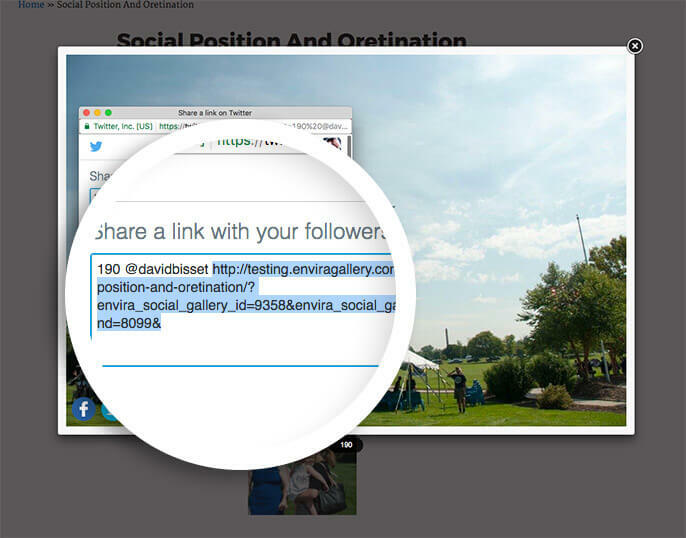 Fix: Sharing links now fully work in Lightbox. Fix: Social icons should no longer be out of view on mobile devices when they are outside the lightbox. Fix: Undefined function inline_notice() error. Added: Option to define Facebook and Twitter text / description when sharing an image from the gallery and/or lightbox view. Fix: Prevent browser tab from closing when social sharing with Facebook is enabled, and URL is opened through a new window. Fix: Captions with HTML elements not rendering social buttons correctly. Fix: Output correct metadata when multiple Galleries embedded on a single Page. Added: Show a dismissible notice if the Social Addon hasn’t been fully configured at global level with Facebook + Twitter details. Fix: Social sharing on gallery images displayed in the lightbox when accessed through an album. Fix: Moved default settings into global/common.php, so default settings are available to frontend galleries and albums not saved since Social Addon activation. Fix: Lightbox sharing failing when using Deeplinking Addon.